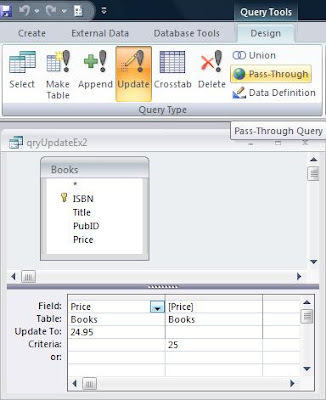 Action Queries, also known as Data Manipulation Language (DML) statements, do not return a dataset like Select Queries, but make changes to the data in the base tables. 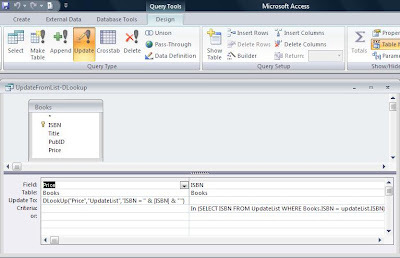 There are four types of action queries: Delete Queries, Update Queries, Append Queries and Make-Table Queries. Last time, I discussed the Delete Query. This time, I'll look at the Update Query. Unfortunately, while you could do this in almost any other SQL implementation (SQL Server or Oracle, for instance) you cannot do this in Access SQL. It will give you the "Operation Must Use an Updateable Query" error. Fortunately, there are a couple of workarounds. One is to use a Join and the other is to use a Domain Aggregate function. One caveat here is that the Join MUST be an updateable dataset, so there must be a unique index on the Join field (in this case ISBN). This solution does not require a unique index, but it is much slower than the Join solution. There are two buttons for running Action Queries The View button displays the results of the query, that is, which records will be updated. The Run button actually updates the records. Next up, the Append Query. Workaround 2 worked brilliantly for me, thanks for sharing. Work around #1 was great. Thank you for the information. 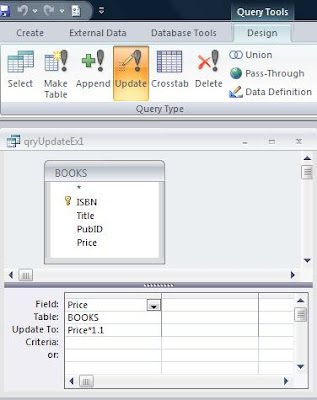 But, what happens if you want to update an existing record with the result of a query? I can run a query on tbl_Expenditure to find out how much I spent on, say, rail fares, but how do I update the field [Annual_Account].Railfares with that value? Been all around the web looking for the answer to this and considering it's such an obvious thing to want to do, no one can explain how to do it. Weird. 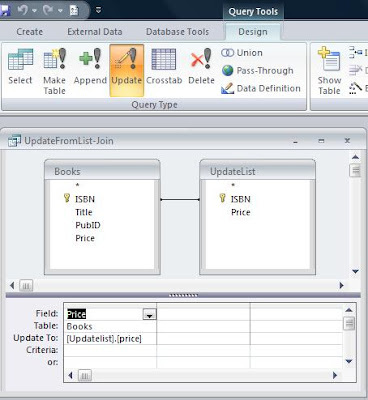 There should be a way to update an existing record with an Update Query, but it depends on a number of factors. This isn't the best venue for support, but if you go to www.utteraccess.com, you can find someone to help you out. I want to update few field with diferrent value conditioned. HOW i can do that?